Pedro Zerbini is currently the No. 20 singles player in the country. Cal's senior captain boasts a 12-5 record at court No. 1 in dual matches this season. The NCAA tournament is still a little less than three weeks away, but the No. 14 Cal men's tennis team isn't focusing on much else. Which is why the team sees tomorrow's 1 p.m. clash with No. 8 Stanford as more of a rehearsal for the tournament, rather than the last dual match of the season. The level of play exhibited by the Cardinal (17-5, 4-1 in the Pac-10) is similar to what the Bears will face in the tournament come May. The bout at the Taube Family Tennis Center in Stanford, Calif., is the second Big Slam of the season but the only one that counts toward Pac-10 rankings. If the Bears (12-6, 3-2) win, they have a shot at a second-place finish in the conference. But rather than linger on the final ranking, the team is concentrating more on how to solidify the strongest possible lineup. 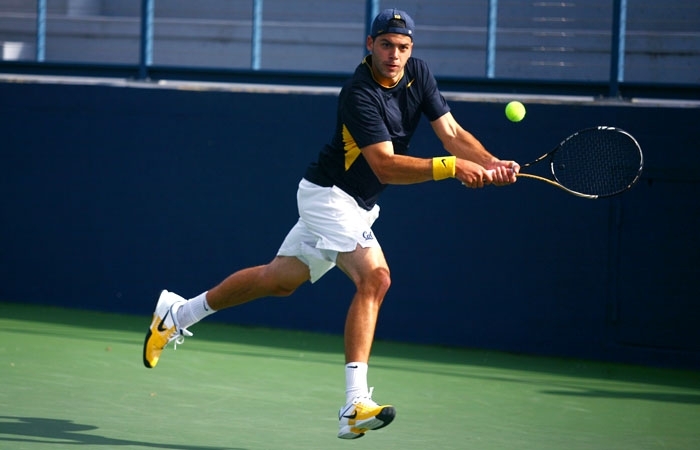 With the return of senior Jonathan Dahan to the starting rotation, Cal needs to resolve some residual chemistry and lineup issues in both doubles and singles, according to coach Peter Wright. In addition to choosing between Dahan and junior Tommie Murphy as senior captain Pedro Zerbini's doubles partner, the Bears will also keep an eye on the lower half of the singles lineup. "We're focused on what our options and opportunities are," Wright said. "Our ultimate goal is to have the best three doubles and best six singles when NCAAs come around." Stanford will undoubtedly give the Bears the test they're looking for. The Card are in the midst of a nine-match winning streak and field top-tier players such as reigning NCAA singles champion junior Bradley Klahn. The No. 9 player also forms the country's No. 3 doubles team with Ryan Thacher. Wright said that while the results from past matchups tilt the scales in favor of Stanford, this year the two teams are pretty evenly matched. In doubles Cal sends out the No. 23 tandem of junior Nick Andrews and sophomore Christoffer Konigsfeldt to combat Klahn and Thacher. And Zerbini, the No. 20 singles player, can hold his own against Klahn; the last time the two top-court competitors met, Zerbini defeated Klahn, 7-5, 7-5. Despite the added significance of the lauded cross-Bay rivalry, senior Bozhidar Katsarov said the team can't look at this match any differently than the rest of the duals this season. "It means a lot when it comes to these two schools," he said. "But we try not to put too much pressure on it. We can't get too hyped up, because when we come out we really have to be ready to go." Cal is coming off a two-week hiatus from competition after a narrow 4-3 loss to No. 22 Washington. While the Bears don't have a winning streak as impressive as Stanford's nine straight - the longest Cal went without losing was four wins - they also have never lost two in a row, a feat they hope to continue this weekend. "There's a lot on the line for both teams," Wright said. "For both of us, this is the last match. We want to win and go into NCAAs on a high, but that can only happen to one of us."